If you own a business, you probably invest quite a bit of time and money trying to entice customers to your front doors. Maybe you have spent money on landscaping and attractive signs, and brightened up your door with advertising or bright colors. While these can all be effective ways to lure customers, many companies overlook a basic problem: litter and dirt on the street, sidewalk and other outdoor areas of their business. A clean entryway to a business and a clean street make your business look more professional and appealing to anyone walking by. It can encourage repeat customers and new customers alike. In addition, keeping the streets and outdoor areas of your company free of debris and litter can enhance safety. Street sweepers are machines designed to help you keep your outdoor areas clean in a more efficient way. Street sweepers have a big job to do: There is a considerable amount of debris and litter on our streets, and the cost of cleaning it up is significant. 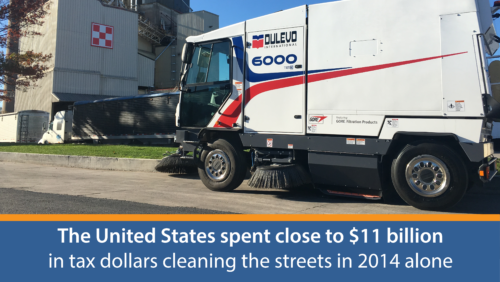 The United States spent close to $11 billion in tax dollars cleaning the streets in 2014 alone, and private businesses spent additional amounts keeping their own streets and outdoor areas clean. How much are you spending on keeping your outdoor areas clean? If you’re relying on your local city or a private cleaning service, you’re relying on someone else’s schedule. Having your own fleet of sweepers allows you to clean up debris and messes as they happen, ensuring customers always arrive when your business is looking its very best. Litter and debris outside can cause accidents. Trip-and-fall accidents are a major cause of broken bones, soft-tissue tears and other injuries. Any pieces of litter outside — including bottles, newspapers and plastic bags — can pose a tripping hazard. Worse, broken glass can cause cuts and lacerations, which can cause serious injury to your employees, yourself and your customers and their families. Debris and garbage can reduce property values. In real estate, curb appeal counts for a lot. When the outdoor area of your business looks its best, your property value is higher than it would be if the area were messy. Your company’s property value is mission-critical if you decide to sell or apply for financing. Keeping your property looking its best indoors and outdoors is an important part of your future business success. An untidy outdoor area can cost you business. Would you give your hard-earned money to a business or retailer who didn’t take care to keep their front area clean? Would you want to give them your repeat business if they made you wade through debris and old trash to get to the front door? Customers make snap judgments about businesses and have plenty of your competitors to choose from. Make it easier for them to choose you by making your entryways and outdoor areas welcoming. Make them as clean as possible with street sweepers, so people feel good about doing business with you. Debris may make you vulnerable to lawsuits. If someone gets a cut on glass outside of your door or on the sidewalk in front of your company, you may be vulnerable to legal action. Similarly, if someone breaks an arm because there was debris anywhere in your outdoor area, parking lot or street, your business could be facing a lawsuit.The expense and time involved in legal action take away from your success and can even threaten the future of your company. Keeping your property clean reduces the risk of lawsuits and keeps you focused on moving forward with success. Some litter and garbage is toxic and dangerous to your health. While most debris is simply a nuisance, some can be downright hazardous. An unlit cigarette can cause a fire on your business property or can cause harm to underground water sources. A gasoline spill can put you at risk of fire, too. Dangerous or toxic chemicals could make you, your employees and even your customers ill. Keeping your sidewalks, streets and other outdoor areas clean with sweepers helps keep everyone safer. Litter can make your business more vulnerable to vandalism. When property owners don’t take care of their real estate, vandals, thieves and other criminals may assume the properties are not under surveillance or aren’t being properly taken care of. According to the “broken window” theory, when a property is poorly maintained, crime is more common. This theory was confirmed in 2008, when scientists ran an experiment in which they left money sticking out of a mailbox. When the property was well maintained with no litter or graffiti present, the money was stolen 13 percent of the time by passersby. When litter was placed in the same area, the money was stolen 25 percent of the time. When you have your own sweeper or fleet of street sweepers, you get to decide how and when your street will be cleaned. You don’t have to rely on the city or on a service to show up on its own schedule. With your own street sweeper, you can clean up any debris the instant it happens, keeping everyone at your business safer and making your business look its best. Clean streets show you care about your business. We all feel good about doing business with a company that takes pride in itself and its customers. When your business has clean streets, sidewalks, walkways and parking lots, you show you care about all the little details that go into making a customer’s experience exceptional. Clean streets can protect you legally. If someone is injured on your property, being able to show you have your own street sweeper or fleet of street sweepers — and you are serious about cleanliness and safety — can be an important defense against any premises liability lawsuit. Keeping streets clean may discourage littering. 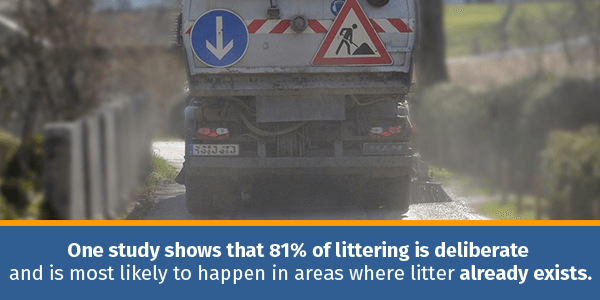 People may be more likely to litter if they are in an area where littering is clearly permitted. One study shows that 81 percent of littering is deliberate and is most likely to happen in areas where litter already exists. A clean space discourages littering and makes it easier for you to maintain a clean outdoor space. Keeping your streets clean can lower your maintenance costs. Litter and debris can attract pests, and rodents and insects can cause destruction to your business property. Preventing infestations in the first place can mean less money spent on repairs and pest control. Mechanical broom sweepers — These sweepers use a brush to scrub the street surface and a hose to pick up debris and dust. Fuel-efficient, these popular models come in highly maneuverable designs, making them a good choice for roads and streets. Thanks to the brushes, they are a strong choice where intensive cleaning is needed. Regenerative air type sweepers — These machines use blasts of air to loosen up dirt and debris. The litter is then swept up through a hose and into a hopper. Waterless sweepers — As the name suggests, these have no water tanks. They are very popular in areas with harsh winters, since they can be used year-round without worry about freezing water tanks. Vacuum sweepers — These sweepers are essentially large vacuums, sucking up debris and litter. They are a good option for litter such as papers, cartons and other traditional litter but may do less for spills and fine materials (such as gravel and sand). They are effective for potholes and gutters, especially. Large street sweepers — These have a wide cleaning path and can clean large surfaces easily. However, they are often not as maneuverable in most cases. Medium sweepers — Medium sweepers have wide cleaning paths and more maneuverability, making them easier to operate on streets and in areas where turns are necessary. Small and micro sweepers — Smaller models of sweepers are easier to store and very easy to move, even in tight outdoor spaces and on narrow sidewalks. Your operators — The number of operators you have and any mobility issues they have can inform the sweepers you choose. Some sweepers have advanced technology designed to make cleaning even easier. They’ll help operators easily pick up and deposit debris in a dumpster, for example. Speed — Some sweepers reach maximum speeds of 20 mph, while other models have higher or lower speed settings. Consider where your sweeper will be used and the speeds the sweeper will need to keep operators safe. Your climate — Some sweepers have air-conditioned and heated cabs as well as other features. Carefully consider the conditions your operators will be working in. If they will be dealing with snow and ice as well as debris, for example, you may need a heavier-duty sweeper able to withstand the elements. If you live in a dry, hot climate, a sweeper with dust-reduction technology can help keep dust to a minimum. The size of your outdoor area — A very large outdoor area will generally require a larger sweeper. This will mean your operators will have to go over the same areas less often and will be able to enjoy a larger cleaning pass, meaning they will need to make fewer repeats over the same area to clean. A more efficient cleaning will mean less time spent on sweeping and labor cost savings for you. The type of surfaces you will need to clean — Narrow paths or many inclines and tight spaces may mean you need a smaller sweeper as part of your fleet. Harder-to-clean surfaces or surfaces in parking lots or outdoor parking areas where gasoline spills are a possibility may require a more intensive sweeper with good brushes designed to clean up the mess. Potholes and gutters may require a sweeper with a good hose and strong suction. Local laws — Check for emissions laws before you shop for your sweeper to ensure your machine meets any requirements. Storage — Consider where your sweeper will be stored when not in use. Do you have room on your business property for your sweeper? Your parking space may determine how large your sweeper can be. If your machine will be stored at another location, consider how your operators will get the sweeper to the garage. Your schedule — If you will need to use your sweepers at night, look for street sweepers with quality lighting and multiple lighting options to ensure visibility. You might also look for quieter models that won’t disturb the area while you clean at night and won’t disturb your customer during the day. Your budget — Picking up one piece of litter costs an estimated $0.30, and making the right choices about your sweepers can make a sizeable difference for your cleaning costs. Always consider operating costs, purchase price and maintenance budget. If you are on a budget, don’t trim costs on quality. Instead, consider used or off-lease sweepers. You may be able to pick up a quality refurbished model for less than a new sweeper. Disposal — Once you pick up debris with your sweeper, where will you dispose of the litter? Will the equipment need to place the debris on a truck for transport, or will you need a machine designed to easily place the accumulated garbage in a dumpster or other receptacle? When choosing street sweepers, you can choose new models. Bortek Industries™, for example, carries sweepers from trusted brands such as Global and Dulevo. We work directly with manufacturers and are a major distributor and retailer — offer sweepers with the latest technology. Bortek Industries™ also sells refurbished and off-lease used street sweepers in a variety of styles and from the top brands. Since we have experienced technicians as well as our own fleet of leased vehicles, we can offer a range of used options that have been carefully tested, refurbished and polished by our professional team. These vehicles are sold for less than new models but still have many years of service and reliable performance left in them. Since we carefully test and fix all of our sweepers, you can be assured of the quality Bortek Industries™ is known for. In fact, Bortek Industries™ has sweeper solutions for all of your needs. Whether you need street sweepers for your outdoor areas, parking lot sweepers, indoor floor cleaners or any industrial cleaning equipment, we have a range of designs, models and styles for you to choose from. You’ll find new, refurbished and used models in stock. We even offer leasing options, repair and maintenance service, parts and more. If you want your business looking its best and need commercial or industrial cleaning machines or equipment to do it, you can always contact Bortek Industries™ for reliable, honest advice and assistance from industry leaders. Contact us today to learn how you can transform your business into its cleanest version of itself.